Discount: $6.25 each when you buy 2 or more. Wei-Tai 999 Gastro Capsule is an herbal supplement that helps promote and maintain general gastrointestinal health by establishing natural balance in the body. Take 2-4 capsules, 2 times a day. Do not overeat, smoke heavily, eat pungent or high acidic foods, consume drinks high in sugar while taking this medicine. Do not use if you are pregnant. 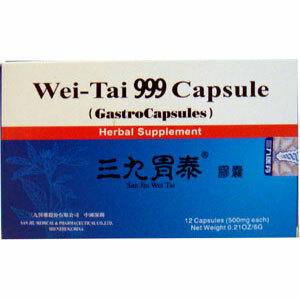 Be the first to review “Wei-Tai 999 Gastro Capsule” Click here to cancel reply.